Swamp Suburbia: The Winds Are a Blowin. The Winds Are a Blowin. It is already supper windy here. The outter bands of hurricane Ike are blowing winds in our direction. It's nice to have some wind blow all the mosquitos away. I went outside today to lunge Ozzie and we were not attacked like we were all the other times. So, there are good things about 30 mph winds. But before I go into Hurricane Ike, I wanted to finish the last leg of my trip to Ohio. On our way home we went through Cave City, Kentucky. 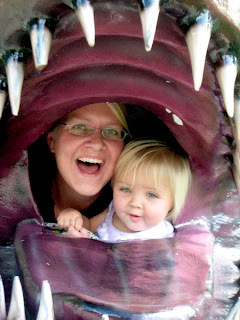 I am not brave enough to go into the caves with three kids, so we ventured to one of my favorite spots, Dinosaur world. We love Dinosaur World. 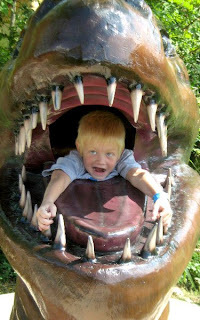 You can get eaten by a T-Rex. Or you could tickle a T-Rex's tongue. 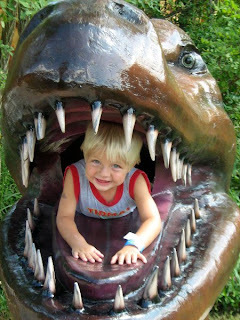 The T-Rex will even eat woman and children. 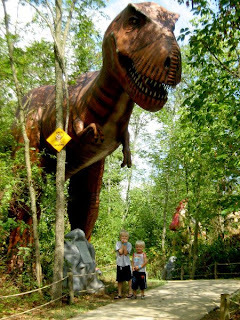 There are so many fun things to do while at Dinosaur World. After we all got a taste of that a Dino's mouth is like we went on a Dinosaur hike. 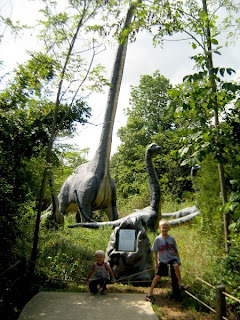 We saw all sorts of Dinosaurs hiding in the bushes and the open fields. 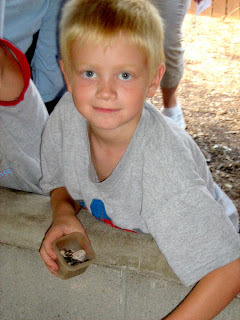 Each Dinosaur had a rock plaque that described what kind of dinosaur it was and what it ate and so on. Big Cowpoke tried to get me to say all the different names. I am sure I got about 90% of the names wrong. Who named those animals such hard names anyway? What is wrong with "Fred-o-saurus". That is nice and easy. The life size replicas were very frightening. I love my little actors. They are such hams. The hike took us through some really beautiful wooded areas. The entire walk was in the shade. It was very nice. We walked up a path to see the Mammoth mountain and the life size replica of the T-Rex. Little Cowpoke looks like he is surfing on the baby mammoth's trunk. It was really neat to read all about the big mammoths. 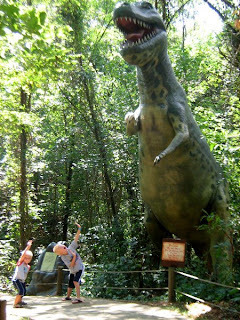 Then there was the mighty T-Rex!! You can hardly see the Cowpokes on his feet. I think I would pee my pants if I ever saw an animal that large in real life. Then it was back down the "mountain" to see some "long necks". I had to stand way back to get the entire neck of that dinosaur in the picture and I still think I might have took the top of its head off. This was the boys' favorite part. There was a clearing in the woods with a bunch of Dinosaurs. There were a bunch of unsuspecting leaf eaters. In the corner was the mighty T-Rex. Big Cowpoke had all sorts of stories about how the T-Rex was going to eat all the other Dinosaurs. He was going to rip off their heads and eat their necks. He has such a splendid imagination. Little Cowpoke thought it was silly, all the story telling. Then around the last bend was one last T-Rex. Big Cowpoke was scared. It was a really nice walk. 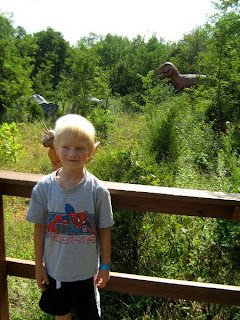 There were a lot of new dinosaurs added to the walk since we had been there. 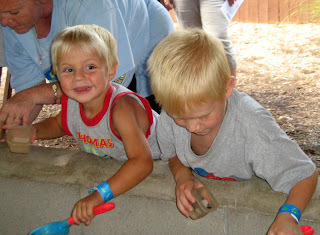 After the walk the boys went and dug for dinosaur bones. Little Cowpoke did not really understand about sifting the sand and then putting the findings in his cup. He would put all the findings and the sand in his cup. Big Cowpoke was excited about finding a shark's tooth. There were other dinosaur bones and things in the sand. They boys got to keep three things. They were really excited. It was a great way to stretch our legs. As we continued on our way, I saw the cutest baby donkey. 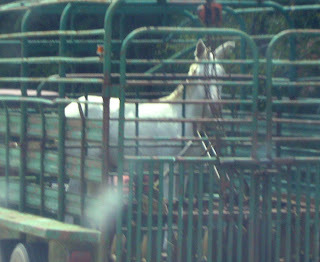 He was in the back of a trailer and his ears were flapping all over the place. It was so cute. The little Donkey must have evacuated and was headed home. When we got closer to home the Cowpokes were hungry, so we stopped at a Sonic. 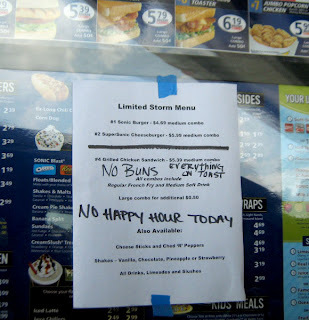 They had a hurricane menu. Good thing the boys didn't want any burgers, because they were all out of buns. I topped off the gas tank and then headed home. I was so happy when I pulled up in my driveway. I made it home by 4 pm. Hallelujah. Mr. Cowboy just packed up and left. He is on call this weekend. So the kids and I are are here all by ourselves. Mr. Cowboy is going to be staying at a nursing home. Hopefully they won't loose power. I am hoping I won't loose power. I so do not know how to start a generator or even hook it to my house. I hate that Mr. Cowboy loves his work so much. So why no buns? Do they have to save them to use them as sandbags in case of flooding? 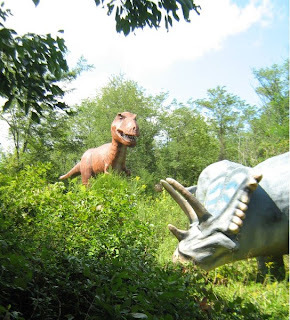 Funny how there seems to be a Dino world in just about every state, with the same kinds of dino statues, too. 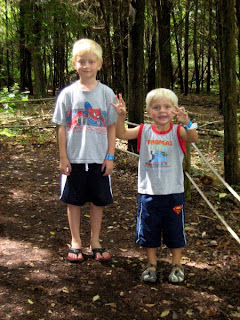 My boys loved the one in Florida we went to over 6 year ago. I loe when they put the dinos in such a pretty forest setting so they feel so real. 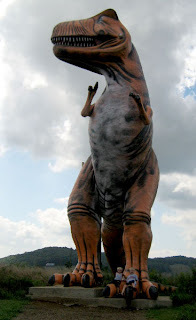 That life size T-Rex is amazing! Your kids look tiny! I loved all your photos. Especially the one of little cow pokette and you in the dino mouth. So cute!! Time to learn how to operate the generator, eh? Please be careful and keep us updated as you are able. Thinking calm, peaceful, anti-storm thoughts for all of you. 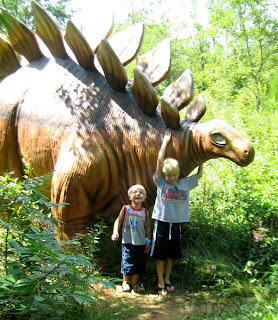 You'll have to come see the DINO NATIONAL MONUMENT here! You'd love it! I need kids so I can have excuses to go to places like this! I have never heard of that place but it looks amazing ,I would love to take my boys there ! Oh my gosh! I didn't know you were all by yourself! You are so strong. I admire you. I won't let Bubba leave my side right now. lol Not that he can save me from bad weather but at least he's here for me to wake up and tell him I'm scared. (he hates me doing that) haha! It hasn't been bad here yet. I hate the waiting. You take care of you and yours girl. Prayers your way! 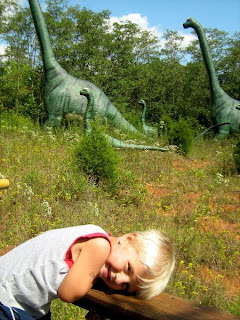 Dinosaur world looks awesome! Our kids would have a ball there. Hope you stay safe, we'll be praying for you. Goodness...you have been really busy since that last storm! I love, love, love, the pictures of your kids with the mini's, and with the T-Rex. How cool are those dinosaurs??? Where did you go to horse college at? Great pics! lOve the dino's, so lifelike!! 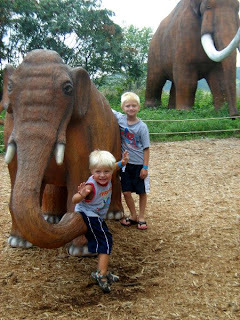 We are getting Ike right now, won't really be over us till about 2 p.m.
OMG, those dinos are too cool! I want to go! Now I want to watch Jurassic Park again! I have always been so fascinated by the dinos! I loved the old Godzilla movies, too! Sounds like you had such an adventurous time on your trip. I love the dino shots! I'm with you--Fred-a-saurus would be a lovely name. I will think of you every time I'm trying to pronounce one of those silly dino names! What I have Really Been Doing. What Else Can They Come Up With? Get the Heck Out of Dodge.